An air of excitement reigns over the archeological world today as the Egyptian Minister of Antiquities confirmed the recent discovery of a new tomb, a buried pyramid in the Valley of the Kings. There is strong evidence to suggest that the tomb is that of King Tutankhamun's Queen, Ankhesenamun. Designated KV64, this is the 64th tomb to be mapped within the Valley of the Kings and it promises to shed more light on the short life and reign of King Tut. Cataloguing of the artefacts discovered in the tomb has already commenced and the release of the first images of these magnificent treasures has astounded Egyptologists around the world, adding further weight to the belief that this might indeed be the tomb of a queen. OK........ just kidding! 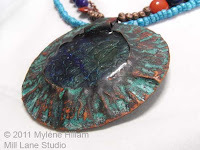 The real story here is that the wonderful focal pendant you see above was made by my Bead Soup Blog Party partner, Nicole Rennell of Nicole Rennell Designs. But it really does look like it could have come from an archeological dig, don't you think? I didn't end up using the selection of beads Nicole sent me because as soon as I saw the pendant, I knew I wanted to create an Egyptian-themed piece. From Nicole: pendant, metal rings and disks, toggle and metal beads. From my own Soup Kitchen: turquoise coloured coconut beads, lapis lazuli rounds, red jasper coins and copper chain. The Blog Soup Bead Party has been such a fun event to participate in and my thanks go to my partner Nicole for the inspiring components she sent and to Lori for the incredible amount of time she put into organising the event. Without either of them, this ancient artefact would never have come into being. 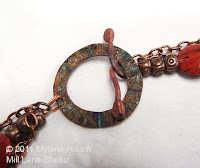 I hope you'll check out all the other fabulous bloggers who took part in the Bead Soup Blog Party (see the page link at the top of my blog) but especially, please stop by Nicole's blog to see how she went with the Bead Soup I sent her. Wow, amazing piece Mylene!! It certainly does look like an Egyptian relic. Thanks so much for being a great BSBP partner, I really enjoyed working with your items and getting to know your work. Thanks Sara. It is a fab idea, isn't it? I've found so many new and interesting blogs to follow. There will be another one later in the year. You should put your name down.... you'd love it! Amazing. Sooooo beautiful. I love the colors and the piece you made out of it.Very well done!! That is a GORGEOUS piece!!! Love how you wrote your blog! Perfect into for such a lovely piece! As usual, you rocked it, my friend! Hope to see you in LA! Yes it certainly does look like an ancient piece - you done beautiful work! What a fun idea to do an Egyptian theme! Beautiful work! I love it!! Totally cool - the colors are incredible! I DO love that focal! Love this! You can really imagine one of the great queens of Egypt wearing this. Yes, indeed; fit for a queen - Egyptian or otherwise! Lovely, lovely piece! I was getting really excited about the new tomb...but you did the tease justice. Great piece!! WOW WOW WOW!!! A stunning piece! Wow, your necklace is gorgeous! You totally chose the right idea for that beautiful focal! Great job! Beautiful work with that focal! Great design! I love this necklace! It's really talking to me... wow. Great! Great! I love how your design compliments that fabulous focal pendant! It truly is a stunning piece. 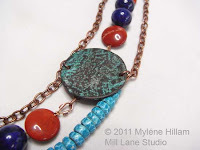 Mylene, what a beautiful necklace! Very regal, love the mix of deep blues, reds and copper. Gorgeous! I am very into Egyptian art, and even though I though that the link wasn't right I kept reading. and good thing I did. What a magnificent necklace you've made. I bet that the past Egyptian queens are fighting over it! Hahahahaha you had me at "Egyptian Artifacts" hahaha your awesome! This is lovely I love what you did and honestly it is cool enough for *Mrs. Tut*! Thanks for the chuckle! Happy Hopping! I just love your necklace! Really beautiful use of color and texture. love the rusticness of it. It is fir for a queen! LOL! I love how you started off your post! Absolutely perfect for such a great necklace! This is just a stunning piece, I'm absolutely in love with what you did. What a great story, I actually went past it when I first arrived!! You necklace is gorgeous!! The pendant is amazing. Wow, amazing piece and I love the story you created. What an incredible focal component! I love the necklace you designed for it! Beautiful piece! I just love the Egyptian inspiration- it totally works! Beautiful! Very nic piece. Love the color scheme and your blog intro was so clever! Beautiful piece - you did that stunning focal proud! Cleopatra would have loved it. Wonderfully done -- and it DOES look like an artifact! I hope you'll join me next time -- the blog badge and dates are up on my blog now. You're right, the focal has a wonderful, ancient feel. LOVE what you did with the necklace! Very nice a real statement piece, that focal is fantastic. Awesome!! It does look like it came from a dig and had I been there I would have snagged this one for myself:) Your stunning design really complemetns the pendant. LOL! You had me going there for a while! It's a lovely necklace. WOW! That is absolutely GORGEOUS! What a wonderful piece! And I loved your little intro *giggle* very fun! Fab, I love the ancient feel of this, great job! Beuatiful necklace, I love the beads you choose to go with that lovely focal! Oh I just love your sense of humor...great job with the post..not to mention the gorgeous necklace. So wonderfully designed. Choosing an Egyptian theme was brilliant and that turned out looking like a museum piece. GORGEOUS! Gorgeous! Isn't it funny how sometimes our creative eye sees something right away that others wouldn't see? Love the Egyptian theme...Really beautiful! Beautiful piece! Your addition of beads with the ones Nicole sent you resulted in a stunning design. Love your teaser opening. 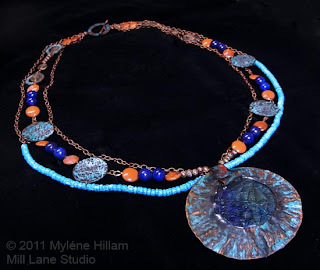 Great focal and great piece of jewelry you created. Stunning, gorgeous, beautiful! wow! I really love your work! Fab necklace! I really like the egyptian theme and all the little details in the design. I read the title of this post, saw the first picture and thought to myself, "This can't be the BSBP post...." So I started scrolling down through your other posts. LOL. Beautiful necklace! It DOES look like it's precious enough to belong in a museum. Wonderful creation, definitely Egyptian theme. Love how it all flows together. Simply stunning! I love the antique feel and fantastic color palette. Your theme complimented your soup so well. I would love to have this added to my jewelry collection! Your necklace is jaw-dropping! 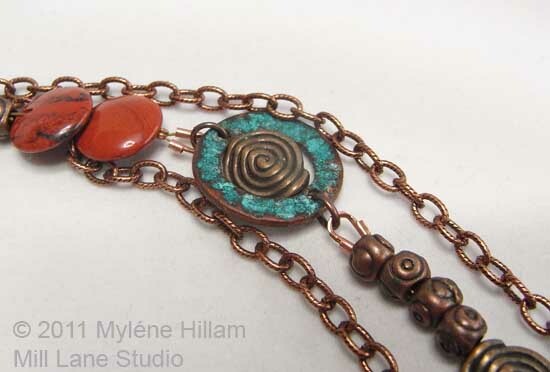 It does look like an ancient artefact, the colours, the bronze tone mixed to turquoise and orange, the whole design... There is so much te learn here! The components you used are quite stunning and I love how you pulled all the beautiful colors out them. So beautifully done! Well, that is absolutely awesome! You had me from the beginning! It very well could have come from an ancient tomb, great storyline! Really, your piece is beautiful! You did a fantastic job! Thanks for your sweet comment on my soup mix! Hope you enjoyed this party, I certainly did! Have a great week! Okay, so you had me going there for a nano-sec, haha! Your necklace truly does look fit for a queen, it's so regal and beautiful, wonderful work! Really well put together and is definitely reminiscent of a relic. I love those wonderful colors! Adore the piece, the theme, the news story! You were given a pretty incredible focal to work with and you clearly had fun with it. WOW! GORGEOUS!!! looks like it was unearthed and dusted off and shined up. you nailed the Egyptian look! yet it is so wearable in today's times! Fantastic!!! Love you post! You are very creative. Love the Egyptian piece you created. So cool! I love the aftifactiness of it. Beautiful job on your Egyptian piece. Love the items you added too. You really had me going with your lead in, especially because a couple years ago they did find a storage room they initially thought might be a tomb related to King Tut. It is a truly beautiful necklace and you should be proud of your creation. It is very regal and any pharoah's consort would have loved it. You had me going - I was hooked! It does look so Egyptian. Great job. Fantastic -- and great interpretation of the Egyptian style. We’re all being pushed outside our comfort zones — with amazing results! That is an amazing focal, and your necklace features it perfectly. This is gorgeous Mylene! I love the components you were sent and your colour scheme is stunning. Lovely! Your necklace turned out to be something spectacular. In addition, your intro into the piece is absolutely hilarious. Well done all around! You did that focal proud; the turqoise and orangy red were perfect complemets. I love the Egyptian style! This is stunning! Love the beautiful focal and love the style! great job! You did a beautiful job on this very unique piece. Great story as well! I love the addition of the Lapis..very Egyptian, indeed. Your piece looks quit ancient with that amazing focal. what a beautiful necklace! and you did a very good job of giving it the look of an egyptian relic! its a wonderful piece! I'm an archaeologist and I'd say that Nicole's pendant and other findings definitely have the aged patina of an artifact! You did a great job completing the look! I like the three chains and the way you pulled it all together! What a great idea for that pendant. It really looks like an Egyptian artefact. Love the look, great job with your soup. I was completely buying the archaeolgical story! And your result does indeed look like it was excavated from Tut's queen's tomb. Very Valley of the Kings in both colors and style and delicious alltogether! Thanks for your comment on my Soup piece-- about the door leading to an enchanted forest-- great concept. Thanks for participating in the BSBP and now I know where to find your blog. Love this piece!! that focal is stunning and you did a beautiful job with it!!!! Nicole definitely had your design aesthetic in mind when she sent this soup!!! Oh I am still hopping here-Love this necklace, it does indeed look ancient and I LOVE IT! What a great pendant and clasp. Actually I love it all. Great job! I know you will enjoy this beauty! What a beautifully designed necklace, I love it. Sorry I'm late...I move slowly, so many great soups. Thank you for your visit and the lovely comment. wow what a gorgeous necklace, well done !!! It really does look like a museum piece! Way to go!